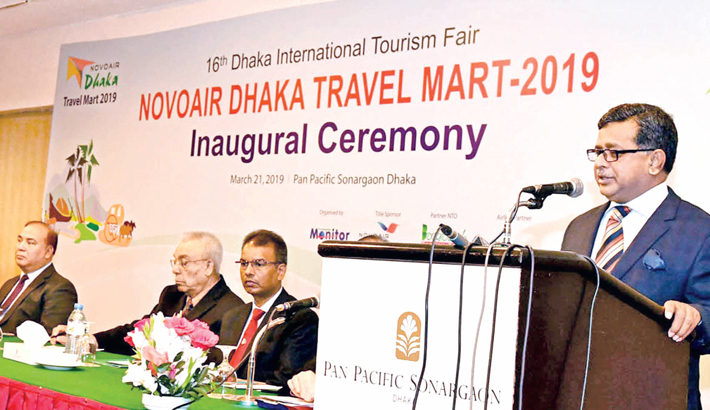 State Minister for Aviation and Tourism M Mahbub Ali speaks at the inaugural ceremony of a 3-day international tourism fair at Pan Pacific Sonargaon Hotel in the capital on Thursday. Social Islami Bank Senior Executive Vice-President Mohammad Forkanullah opens an agent banking outlet of the bank at Char Kawnia in Noakhali on Tuesday. Southeast Bank Chairman Alamgir Kabir poses for a photo with students who excelled in HSC exams at a scholarship programme in the capital on Thursday. KM Mozammel Hoq, Executive Director, Southeast Bank Foundation, chaired the programme. Shareholders experience a hands on coffee-raking exhibit at the Annual Meeting of Shareholders in Seattle, Washington on Wednesday. Business sentiment among large US companies fell for the fourth straight quarter, according to a report on Wednesday that highlighted worries about slowing growth outside the United States. A parking attendant sits as he waits for people to park their car on a street in Beijing on Thursday. China's Geely Automobile Holdings posted an 18 percent jump in annual net profit, driven by higher sales of its sedans and sports utility vehicles (SUVs), but forecast flat sales growth in 2019 due to uncertainty about domestic demand. A boat plies along the river past highrise buildings under construction in Phnom Penh, Cambodia on Thursday. The Cambodian Ministry of Economy and Finance has just proposed a one-stop platform that aims to cater to all business-related concerns and applications. The move is part of the government's efforts in boosting domestic businesses. Commerce Minister Tipu Munshi visits a booth of Chevron Bangladesh at the recently-concluded US Trade Show-2019, jointly organised by the United States Embassy and American Chamber of Commerce in Bangladesh in the capital. ACI Limited Managing Director Dr Arif Dowla presents a crest to IRRI Director General Dr Matthew Morell at a function in the capital on Thursday. Agrani Bank Managing Director and CEO Mohammad Shams-ul Islam presides over a meeting on celebration of the Independence Day at the boardroom of the bank in the capital on Tuesday. Al-Arafah Islami Bank executive committee Chairman Hafez Md Enayet Ullah presides over a meeting of the executive committee of the bank at its boardroom in the capital on Thursday. Bangladesh Development Bank Chairman Mohammad Mejbahuddin is seen at a meeting organised for celebrating the Independence Day at its conference room in the capital on Wednesday.